We've all been captivated by the story of 24-year-old Aimee Copeland, who has been battling her way back to health after an insanely terrifying flesh-eating bacteria almost killed her and caused her to lose leg. Well, it appears flesh-eating bacteria is fast on its way to becoming a horrifying trend, because there's now word that a 36-year-old new mother in South Carolina has the same infection. Lana Kuykendall gave birth to healthy twins on May 7th, and four days later she noticed a spot on her leg that looked like a bruise. She is a paramedic, fortunately, so she acted quickly to get medical treatment, thinking it might be a blood clot. The spot started out about the size of her palm and by six hours later it had grown to cover her whole leg. It's probably because she sought treatment so quickly that she's still alive. Nevertheless, she has undergone four surgeries and is still gravely ill. She's in critical condition and is on a ventilator in the ICU. She may soon require a fifth surgery. Her husband Darren says, "They are saying things are leaning her way. Her vitals are good and her lab results are looking good. But this could go either way at any given time." What's extra scary is that they have no idea how exactly she became infected—though it can occur after any sort of trauma, so it's possible her childbirth played a role. 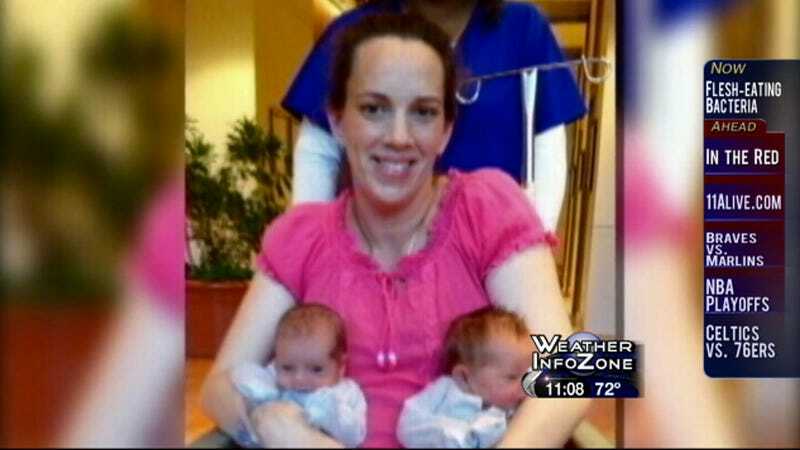 Fortunately, her newborn twins are both perfectly healthy and being taken good care of by her family and friends.